The front page of Portugal's largest daily, Correio da Manha, reads, "Fatima rejects Papal Control". This is the follow up from the day before when every Portuguese Television station ran news stories that the Vatican plans on taking over the shrine of Fatima and keeping its control with the Holy Father. The TV stations sited the Fatima scandals of the two previous years regarding the inter-religious Conference, the Dalai Lama visit and the Hindu prayers at the shrine as possible reasons. No real word from the Vatican on this, so we must not take what the TV stations say as gospel. However, the reaction of the Catholic Church in Portugal is very news worthy. "The Vatican has not and will not supervise the financial assets and theology of Fatima." "This is not an international enterprise. Each diocese raises its money and Fatima is no exception. Only under certain circumstances, for instance the sale of property exceeding a certain amount, can the Vatican interfere. But generally, there is no such interference in the matters of any diocese. ... The statutes of the Fatima Shrine are going to be altered, but not by determination or any imposition by the Vatican. This would not make sense anyway. "One of the scheduled alterations will include the supervision of the Fatima Shrine by the Archbishops of Braga, Evora and Lisbon - that is, the Cardinal Patriarch - next to the bishop of Leiria. This has been in the planning since the 1950s already. Practically, we are going to revive the established norms and rules." "There will be no such deployment. There is no sense to it. Nothing will change. ..."
"The Fatima Shrine has no demand for theological supervision by the Holy See. Nothing irregular in a theological sense ever happened. A supervision by the Holy See would only play into the hands of the radical movements. Where is the spirit of inter-religious dialogue launched by John Paul II and continued by Benedict XVI? Where are the open arms of the Catholic Church?" This bishop seems to think that Rome has no right to make theological intervention unless he, himself, thinks something irregular happened. Rome does not need the approval of any local bishop in matters of faith and morals or for any other reason. As for the spokesman of the Portuguese Bishop's Conference, he seems to be challenging Rome and the Holy Father to a war. If Rome wants to take over the Shrine, it can since Portugal has a Concordance with the Vatican. Property is in the hands of the bishop, "who is in communion with Rome", therefore if Rome removes a bishop, the property is registered with the new bishop. This alone gives Rome the power to do whatsoever it wants. The bishop of Fatima, D. Serafim and the Rector of the Shrine, Msgr. Luciano Guerra refused to comment on this latest controversy in Fatima. What is the truth? It is hard to say. Bishop Serafim retired a year ago and has not yet been replaced. This leads one to think that Rome is planning something, but had to wait because of the death of John Paul II. Fatima does not need this controversy on the week of its biggest event since John Paul II's visit to the shrine. This is the week that Lucia's body will be moved from the Coimbra Convent to Fatima and placed next to Jacinta in the Basilica. It is expected that over 1,000,000 people will be here and already all the hotels are booked. On the day the TV stations announced the Vatican take over, a great celebration took place in Coimbra in honor of Lucia. It started at the Convent with prayers and songs and moved through the streets to one special street. There were TV cameras waiting, the Mayor of Coimbra, other VIP's and TV personalities. They were there to dedicate a street to Lucia and they unveiled a marble stone that said, " Rua of Sister Lucia, Visionary of Fatima." Speeches were given by the Mayor, the VIP's, Lucia's doctor and the three porter nuns from the Convent. 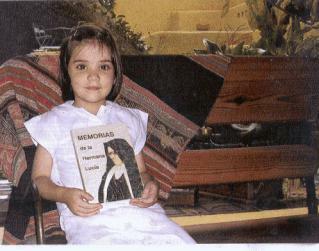 Two days later a special Mass was held at the Convent to honor the first year after her death, February 13th at 5:30 PM. The Mass started at the same time as her death, 5:30 PM and gave the nuns in the convent and the Coimbra people a chance to honor her one last time before her body is moved to Fatima. On February 19th the body of Lucia will be moved to Fatima and on February 20th a grand Mass will be held to welcome her home after 85 years away. A great step towards Lucia's canonization has been taken as Alexandra Maria's miracle cure has been accepted as being through the intersession of Lucia. Her Argentinean mother held the book of Lucia to her heart and prayed for her intersession for her daughter who was about to die. She was instantly cured. The Rector of the Shrine, Msgr. Luciano Guerra, is caught in the middle of this latest controversy but a closer look will show that he has done a marvelous job in administering the Shrine for over 30 years. In 1974 when the Communists wanted to take over the shrine and take down the Basilica, it was Guerra who stopped them. It is Guerra who keeps pretend priests and suspended priests out of the shrine. The bishop of Lisbon organized the Ecumenical Conference and the Hindus visit and when the bishop brought in the Dalai Lama, Msgr. Guerra refused to attend. Most likely if the Vatican took over the Shrine, Msgr. Guerra would remain. It is well known that the vault of the Shrine has hundreds of millions of dollars worth of relics and gifts given to Fatima over the last 80 years, and Msgr. Guerra has been a good custodian of this wealth. It would be something to worry about if one of these more liberal bishops in Portugal were to get their hands on this wealth. What all the truth is we will see in time, but one thing is sure the Vatican will not be happy about the statements of the Bishop's Conference in Portugal and Fatima does not need this kind of publicity. The Vatican's top liturgy official said he expects Pope Benedict XVI to move against liturgical abuse with firm teaching and a gentle manner, recognizing that such mistakes often reflect ignorance, not ill will. At the same time, the pope wants to offer reconciliation to followers of the late French Archbishop Marcel Lefebvre -- but not at the cost of "disowning" the Second Vatican Council, said Cardinal Francis Arinze, the Nigerian who heads the Congregation for Divine Worship and the Sacraments.